We are a working ranch in Pagosa Springs, Colorado, with cows and horses and a brand new 9,000 square foot main house of a log cabin design, wraparound porches and breath taking views. We have horses and cows and wildlife! It is a family friendly ranch where you'll feel right at home from the get go. Elk Trace Ranch is nestled in the beautiful San Juan range of the Rocky Mountains with front row seats to Pagosa Peak, and backs up against the National Forest, for plenty of riding and exploring. HUNTERS WELCOME! Your accomodations include a luxury room, along with a hot tub, lap pool, workout room, sauna and much more. The food is only surpassed by the scenery. Elk Trace is close to town although you'll feel like you're far from it. 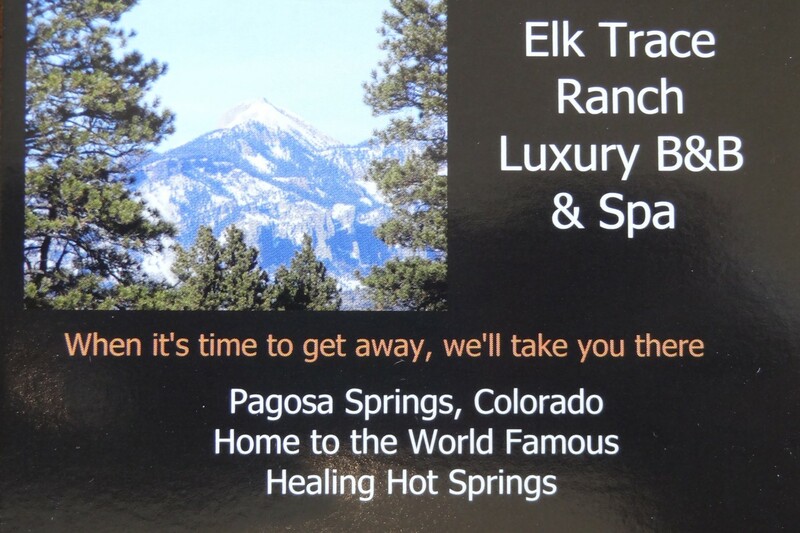 Pagosa Springs offers lots of amenities, including our namesake, the famous hot springs. Wi-Fi too! Also available: Guest Cottage. A private, "your own space" separate residence on the ranch, complete with wood burning stove, kitchenette, bed and bath.